This article appeared in Issue 33 of "Asian Cult Cinema"
Perhaps one of the most controversial films to come out of Japan in recent years, "Battle Royale" (based on the best-selling Koshun Takami novel) is "Lord of the Flies" meets "Survivor" with guns: in a dystopian Japan of the near future, the government places one class of grade nine students on a remote island, gives them each a weapon, and lets them loose in a fight to the death. Despite being branded the rarely-used R15 rating (restricting the film to those aged 15 and over) when it opened at the tail end of 2000, "Battle Royale" quickly became both a critical and box office success, both domestically and in other Asian film markets. And though the film will probably be remembered more for its graphic exploitation of teen violence, "Battle Royale" also makes some rather pointed remarks about Japanese society and history. As explained in the film's opening placards, the story is set in the near future, when Japan is close to collapse, burdened with a faltering economy and double-digit unemployment. The social fabric of the country has become unraveled, with high school students boycotting classes and committing despicable acts of violence against adults. As a result of this anarchy, the government passes the Millennial Reform School Act (known as the BR Act in short). Under the provisions of the BR Act, a yearly Battle Royale is held in which a randomly chosen class of junior high school students are issued weapons and forced to play a twisted Darwinian game of survival in which there can be only one winner. At the start of "Battle Royale", Class B of Zentsuji Middle School has been chosen to play this year's game. Unfortunately, none of the happy-go-lucky students in Class B are aware of their fate. While on what they think is just another field trip, the entire class is rendered unconscious and brought to the 100 square mile arena where they will do battle over the next three days. Included in this unlucky group are Shuya (Tatsuya Fujiwara) and the girl he has a crush on, Noriko (Aki Maeda), who become the emotional center of the story. Also joining the class of 40 students are two 'transfer students', Kawada (Taro Yamamoto) and Kiriyama (Masanobu Ando of "Space Travelers"), who are conspicuously older than the rest of the group and whose presence is a mystery. 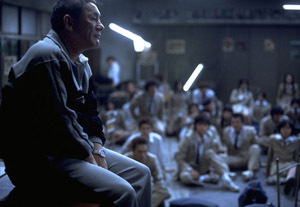 But the students of Class B are given little time to ponder such issues, as they soon find themselves being bullied by their former teacher, Kitano (Japanese cinematic icon Takeshi Kitano, writer/director of films such as "Hana-bi" and "Sonatine"), who with frenzied enthusiasm and an explosive temper, acts as the game's referee. The students are then shown a video, in which a perversely chipper hostess outlines the rules of the games and encourages the students to do their best in gunning each other down. Each student is issued a backpack, containing some food, bottled water, a compass, a map of the island, and a weapon. While some students are issued guns and knives, others are not so fortunate-- Shuya is given a stainless steel pot lid, while Noriko ends up with a pair of binoculars. Another standard issue for every player is an permanently-affixed explosive-laced necklace which can be detonated in one of three ways: remote detonation for those who 'get out of line', detonation by wandering into one of the island's many rotating 'danger zones', and detonation of all necklaces if more than one player remains after 72 hours. Armed to the teeth and scared out of their wits, the players begin the Battle Royale, approaching the game in different ways. Some approach the game with enthusiasm, determined to come out on top at any cost, while others gleefully see the game as a means to settle old scores, such as with the snobbish clique that had ridiculed them in the past. Others are unwilling to kill their friends and loved ones, and end up committing suicide instead. Some students form alliances to sue for peace and an end to the game, while others join forces to try and stop the bloodshed by hacking into the systems that monitor the game. Unfortunately, their altruistic efforts, aimed at the greater good of all players, end up being cut down by the likes of Kiriyama, who seems to take pleasure in killing everyone in sight. Finally, there are those like Shuya and Noriko, who try to stay out of the line of fire, and play defensively only when they have to. As the game progresses and the body count rises, subtitles are used to give a running tally of the latest victims and the number of remaining players. With "Battle Royale", director Kinji Fukasaku (better known to Western audiences as the co-director of the Japanese sequences in "Tora! Tora! Tora!") returns to the blood-and-guts filmmaking that made him famous during the Sixties and Seventies. Fukasaku pulls no punches as he unleashes the unblinking camera on the carnage brought about by the game, and at times, the on-screen violence can be hard to stomach. Given the increasing visibility of school violence in the once-sedate Japan and public opinion polls that name youth crime and violence as the most pressing social issues, "Battle Royale" created a stir in the Japanese parliament prior to its release. After a special screening by members of parliament and other government officials, "Battle Royale" was labeled 'crude and tasteless' and quickly became a battle cry for more government action on media violence, which up until then, had never been an issue. Part of the problem with "Battle Royale" is the greater emphasis on exploitation than examination. The original book went into detail on the society of this alternate universe Japan (which emerged victorious from the Second World War), the logic behind the Battle Royale, as well as the motivations of the characters. Unfortunately, these elements, which would have been far more interesting than merely watching the students kill each other, are ignored or substantially reduced, robbing the on-screen action of both context and logic. This is most evident with Kitano, whose ruthless refereeing and actions in the last reel make little sense. However, despite the narrative shortcomings of the script, the subtext of the story is loud and clear. The most obvious interpretation of "Battle Royale" is as a thinly veiled allegory on the ultra-competitive Japanese higher education system. For the uninitiated, schooling in Japan is broken into nine compulsory grades, which are publicly funded, and the upper-secondary and post-secondary levels, in which the private sector plays a significant role. In the nine compulsory grades, the education system does not stratify students into achievement levels, and moving from one grade to the next is generally assured as long as the student shows up for classes. However, to advance into the higher grades and post-secondary education, students must compete for placement through nationwide examinations, particularly for the more prestigious schools. By gaining entrance into a distinguished high school, a student will be guaranteed placement in one of the better universities. As a result, competition is fierce, with students hiring tutors, attending jukus ('cram schools') up to seven days a week, and even cheating to get ahead. Thus, it is no coincidence that the students picked to play Battle Royale are in the ninth grade. Another interpretation, which is closer to the intent of both Takano and Fukasaku, is the 'zero sum' mindset that dominated Japanese militarism in the early part of the Twentieth century. During the period of Japanese political expansion prior to both World Wars, diplomacy was viewed by the Japanese government as a 'zero sum' game, in which one country could only achieve its objectives at the expense of another. This mindset was particularly evident in Japan's relations with its Asian neighbors, Russia, and, of course, the United States. Likewise, the players in Battle Royale are faced with a 'zero sum' situation, where there can be only one winner. However, what is interesting is that the characters actually come up with creative alternatives to the 'zero sum' outcome, allowing multiple survivors. Unfortunately, these options require implicit trust among the players, a hard commodity to come by in their environment. One of the more interesting scenes in "Battle Royale" illustrates how trust can quickly become undermined, as a seemingly stable alliance among a group of female students degenerates into a bloodbath after suspicions are raised. Given the current concern over teen violence in North America, there is little chance that "Battle Royale" will be released theatrically stateside. However, "Battle Royale" has recently become available as a Hong Kong import VCD, which can be purchased over the Internet or at Chinese stores. Though this controversial film erroneously eschews the novel's more meaningful aspects in favor of exploitational thrills, "Battle Royale" still remains a dark, thought-provoking, and memorable exploration of humanity caught in a 'zero sum' game of life. Images courtesy of Toei Co. All rights reserved.